On the fifth anniversary of South African statesman Nelson Mandela’s death, it’s worthwhile to remember how his thinking moved from violence to reconciliation as the solution to undoing apartheid. On his journey to a different approach, Mandela visited Algeria – a place where the revolutionary thinker Frantz Fanon also developed his ideas on armed struggle. A grim revolutionary war started in Algeria in 1954 between the indigenous Arab population, mainly represented by the Algerian National Liberation Front (FLN), and the French on behalf of the white settlers. The casualties numbered around 300 000 with two million Algerians displaced and one million settlers returning to France. The conflict came to an end in 1962 when French President Charles de Gaulle called out a referendum on whether Algeria should remain as part of France. The vote was overwhelmingly in favour of independence. This revolution had a profound effect on both Mandela and Fanon’s thinking. It shaped a great deal of their respective understanding about colonisation, oppression and freedom. Mandela was an ardent freedom fighter in the early days of South Africa’s liberation struggle – he co-founded the ANC’s military wing Umkhonto weSizwe in December 1961. He believed that violence was necessary in resisting the repressive and brutal apartheid regime. He was eventually imprisoned for attempting to overthrow South Africa’s apartheid regime. Mandela and seven of his comrades were convicted of sabotage in 1964. Mandela visited troops of the FLN in Morocco earlier in 1961 during a tour of Africa designed to establish Umkhonto weSizwe as the armed wing of the African National Congress (ANC). 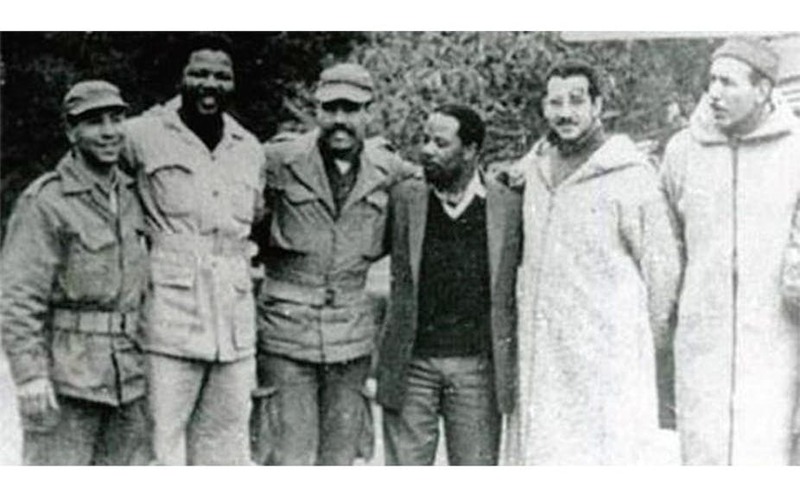 Later that year he travelled to Algeria to participate in joint exercises between the ANC and the FLN. Algeria also came to be the first country Mandela visited after he was released from prison in 1990. This was a symbolic gesture to acknowledge the inspiration he drew from the North African nation’s revolution and support for the struggle against apartheid. The Algerian Revolution inspired Mandela. In his autobiography, Long Walk to Freedom, he compares their situation as the closest to that of the ANC in South Africa. The rebels in Algeria also had to face a government representing a sizeable white community controlling most of the indigenous population who were not white. The Algerian Revolution made a profound imprint on Fanon’s work, too. He hailed from the island of Martinique in the Caribbean, then studied psychiatry in France and ultimately ended up working in an Algerian hospital in the 1950s. It was there that he became acutely aware of the damage oppression wages both on the colonised and the colonist. Fanon became a member of the FLN and was involved in the resistance against the French. Fanon is considered by some as an advocate of violence because of the prominent role it plays in his work, which can be read from a certain angle as a kind of manifesto. But he did not glamorise violence. The point for him was rather that violence becomes a necessary response to oppression where the oppressor does not recognise the humanity of the oppressed. There are only a few references to apartheid in Fanon’s famous work, The Wretched of the Earth, but he saw the situation in South Africa as an exemplification of the struggle for decolonisation. Fanon’s ideas played an important role in South African political thinker Steve Biko’s work on the ideology of Black Consciousness. Mandela and Fanon never met. By the time that Mandela visited Algeria, Fanon was on his death bed in Washington DC; he had leukaemia, and would die at the age of just 36. Fanon’s ideas didn’t feature in Mandela’s thinking, but one could imagine a conversation between them. There would be some points of agreement, and some areas in which they’d differ. There would be agreement between Mandela and Fanon on the role of violence as a necessary foil to oppressive regimes. This was Mandela’s train of thought during his visit to Algeria when he emphasised armed struggle. Mandela’s thinking about the role of violence changed during his 27 years in jail. He realised that violence was necessary to counter and undo the institutions of apartheid. Violence has its place in purifying society of institutional oppression, racism and hate but it cannot continue indefinitely. Once apartheid was undone, Mandela reasoned, violence would only become a destructive force. Mandela opted for reconciliation with the old oppressors, which had mixed results in retrospect. What might Fanon say about Mandela’s eventual change of mind? He would probably praise the South African’s acknowledgement of the damage which oppression does to both the oppressor and the oppressed. Reconciliation – or what Fanon called mutual recognition – becomes a remedy, absolving both sides of culpability for the violence which they exercised. Fanon might criticise Mandela regarding the decision to embrace neo-liberal capitalism, which has led economic injustice to persist on a massive scale. There is one major achievement in Mandela’s compromise which Fanon would acknowledge: his decision to include oppressor and oppressed as part of the post-apartheid dispensation has brought about the promise of something like the new humanity that Fanon envisioned beyond decolonisation.